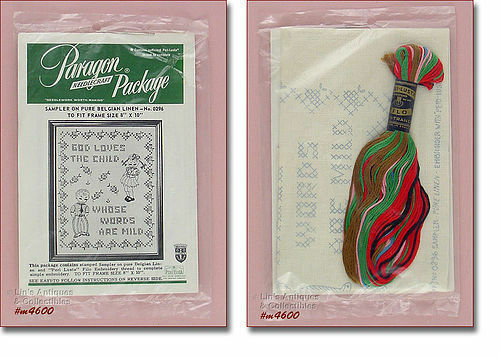 This listing has a vintage unopened Paragon sampler kit! 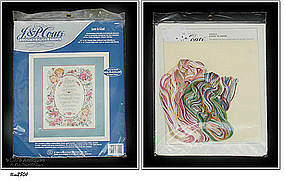 Per package, sampler is on pure Belgian linen and will fit 8” x 10” frame. It is kit number 0296. Per package: “contains stamped sampler on pure Belgian linen and “Peri Lusta” Filo embroidery thread”. The verse is “God Loves the Child Whose Words are Mild”. 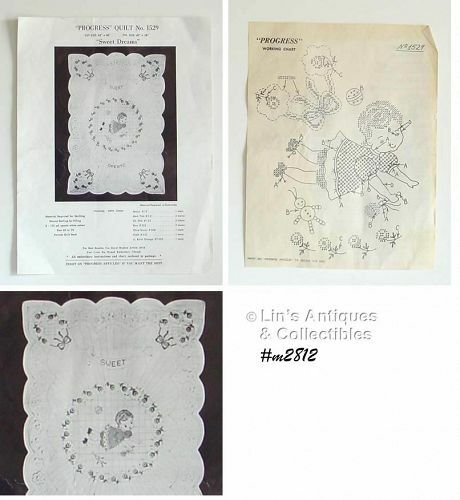 This is a vintage quilt kit – top, binding, and instructions – to complete a beautiful baby quilt titled “Sweet Dreams”. Quilt is stamped cross-stitch and embroidery, cut size is 42” x 60” with finished size 40” x 58”. This is a “Progress” quilt, no. 1529, and lists the thread requirements, backing, etc. that are needed to complete the quilt. Made by J. & P. Coats, this is a counted cross-stitch kit titled “Love is Kind”. Never opened, kit contains cotton embroidery floss, gold beads, 14 count ivory Aida, thread holder and instructions. It has a copyright date of 1994.